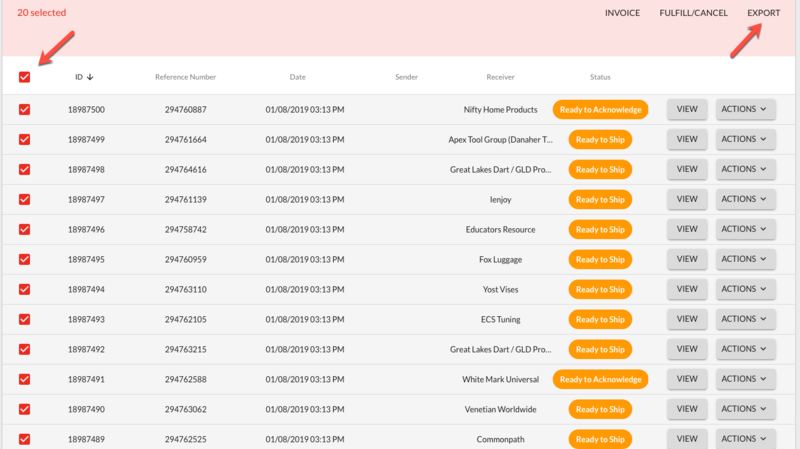 In addition to the ability to use the Portal to ship orders in bulk from the actual Order Management screen, you may also import tracking numbers in bulk via our Import Tracking Information feature. Bulk import tracking information will create Shipments (ASNs) automatically using a spreadsheet (Excel or CSV format). IMPORTANT: Some retailers have a custom shipment format that does not work with this feature. This feature is for retailers and suppliers that are using our standard templates. If you are unable to use the Import Tracking Information feature, please contact Logicbroker Support for additional details on alternative ways to import tracking via the Portal. 1. Navigate to Orders --> Order Management. 2. 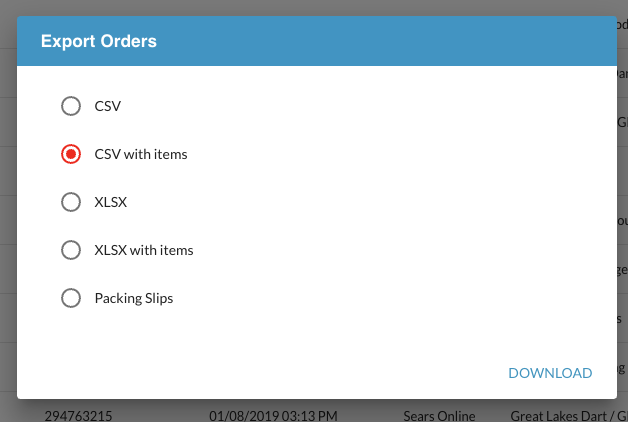 To properly upload your tracking information and create new shipments, you will need to export your orders via the Order Management page. With your orders selected, click on Export. 3. Determine which format you would like the export to be. We highly recommend the XLSX with items export. NOTE: If you choose to export "with items", you will have the ability to select which items ship. If you only choose without, when you upload the file all items will get marked as shipped for that order. NOTE: The key identifier that links to your orders will be the ID column. This is the ID of the document in the Logicbroker system. 5. Once you add the above information, save the file locally to your computer. Go back to the Order Management screen and click on Import Tracking. Select and upload your file. 6. Once uploaded, the results will display with all successful and failed documents processed. If you are subscribed to receive failed tracking uploads (Tracking Upload Failed), you will receive an email as well.